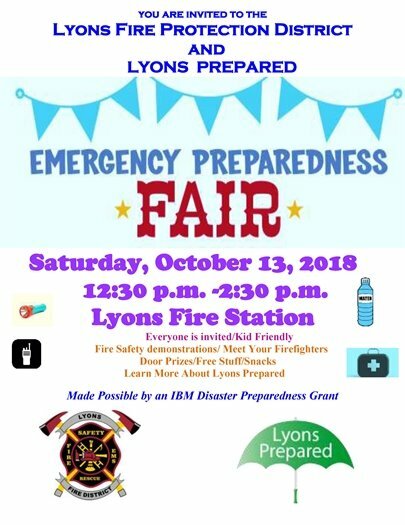 Lyons, and tigers, and bears - oh my! The spooky season has arrived! 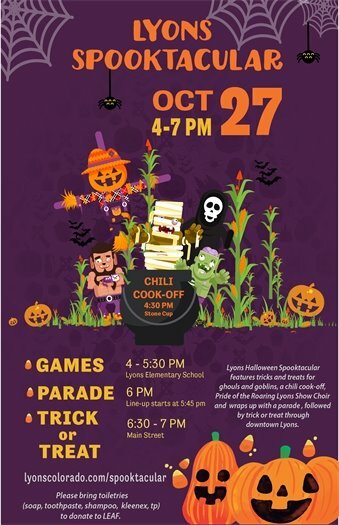 Grab your costume and join the community on October 27, for the 2018 Lyons Halloween Spooktacular. This year's activities include the Stone Cup Chili Cook-off, music, Bongo the Balloon Man, live performances by the Pride of the Roaring Lyons Show Choir, tricks, treats, and games for ghouls and goblins, all leading up to the parade through Town. Games and activities will be held at Lyons Elementary School east playground, from 4 to 5:30 p.m. New this year! Help support the Lyons Emergency Assistance Fund (LEAF), by donating new and unused toiletries! Please bring donations to the spooky games and activities at Lyons Elementary. All are welcome to be a part of the parade! The parade lineup will begin at 5:45 p.m., on 3rd and High St. in front of the elementary school; the parade down Main Street will begin promptly at 6 p.m., followed by downtown trick-or-treating at 6:30 p.m.
Join us for a spooktacular evening in Lyons - a good time will behead by all!! Friday, Oct. 19 | 3:00 p.m. | 4th and Railroad Ave.
Bring your chairs and blankets and join us for our first Reels on the River outdoor movie, hosted by River Cliff Realty! The inaugural showing will be the popular film, The Addams Family. 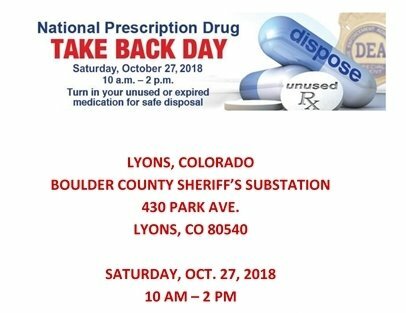 Help kick-off fall in Lyons with your community spirit! Tickets available in advance at River Cliff Realty (419 Main Street) or at the event, for a $1 donation per person. Everyone is invited to Trivia Night on Tuesday, October 16 at Pizza Bar 66, hosted by Lyons' very own trivia guru, Ian Phillips. Teams of up to 6 players should check-in at 6:30 p.m., as Trivia will start promptly at 7 p.m. If you don't have a team, we will help you find one. Arrive early to order food and beverages, and to get a good seat. Wrong answers. Right answers -- it's really about having fun for a great cause. $10 per person suggested donation, with all proceeds to Friends of Lyons Regional Library. Donations will be used towards purchase of a new, much requested desktop computer for community use at the Library. Play for glory with your neighbors, get a clue with your Book Club or come solo and join a team. And yes, there are prizes for the winning team. Thank you to local business supporters, including Pizza Bar 66 and TK Barbershop and Salon. 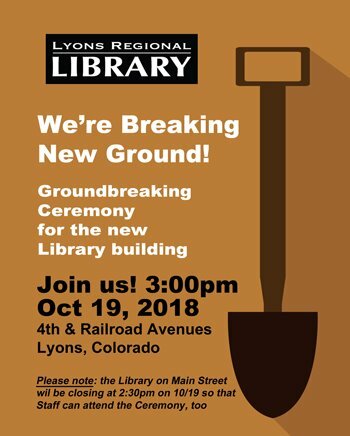 Friends of Lyons Regional Library is a nonprofit organization of volunteers supporting the library by fostering public awareness, sharing enthusiasm for learning, and enhancing the library’s service to the community.